An injury to muscles and tendons of the mid back (thoracic) region. It usually presents as pain, swelling and/or muscle spasms in the back that affects one side and is worse with movement. It is caused by prolonged overuse of the muscles and tendons of the back, usually due to improper body mechanics and posture, or due to a single violent injury such as a motor vehicle accident. 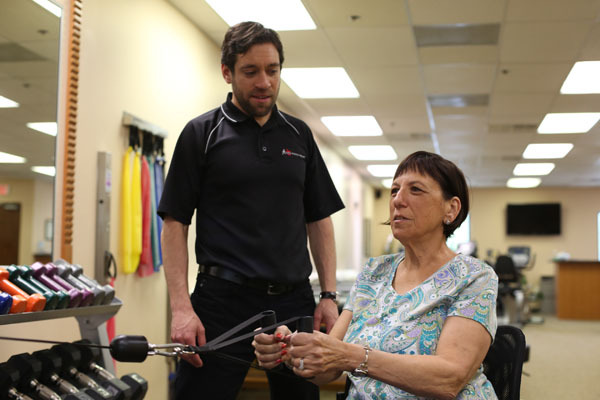 The Physical Therapists at Apple Physical Therapy will design a personalized treatment plan specific to you and your injury that will include stretching and range of motion exercises to improve mobility in your back, arms and legs. We will also incorporate specific strengthening exercises focused on your core musculature and the muscles of your shoulders, arms and legs to allow you to maintain proper posture both at rest and during activity. Manual therapy (gentle hands on techniques) such as massage and stretching may be used to improve the mobility of stiff joints and tight muscles that may be contributing to your symptoms. If necessary, your PT may elect to use modalities such as heat, ice and/or electrical stimulation to help reduce pain and ready the body for exercise.